Our article “The spatial distribution of U.S. Republican and Democratic climate opinions at state and local scales” appears today in the journal Climatic Change Letters. We’re also launching a new interactive set of maps. The paper and maps describe the distribution of both Democratic and Republican opinions on climate change across all US states and congressional districts. The maps illustrate, for example, that 69% of Democrats in Alabama believe climate change is happening, but that is the lowest percentage of any states; in Oregon and California 88% of Democrats believe it is happening, and in Texas, it’s 82%. The new results build on our prior work (e.g., Howe et al. 2013, and Mildenberger et al., 2015) that estimated climate change opinions at state and local scales among the general population. This project, however, for the first time, maps spatial variations in opinion within the populations of Democrats and Republicans respectively. The article and the maps should provide new insights into the political dynamics of climate change opinion and suggest new opportunities for bipartisan conversations about how to best address this critical challenge. 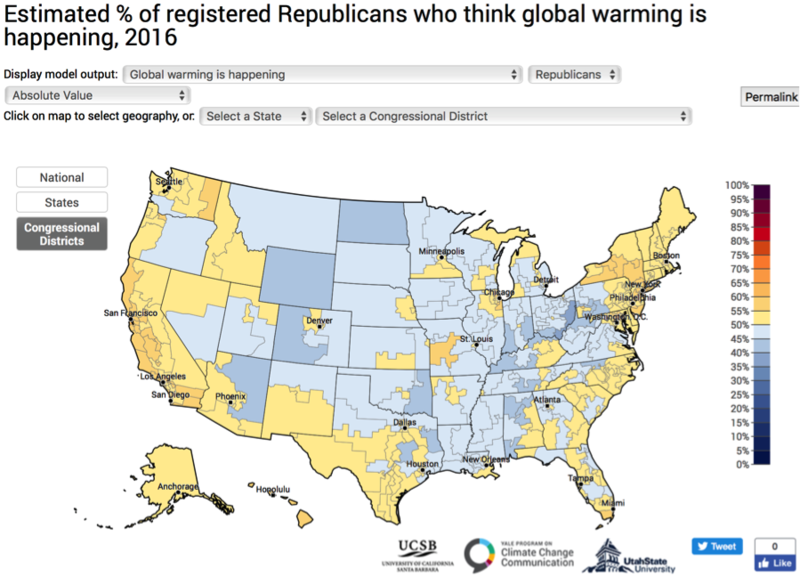 Please visit the online interactive maps to explore these partisan climate change opinions where you live and across the nation. The article is available here to those with a subscription to Climatic Change Letters. If you would like to request a copy, please send an email to climatechange@yale.edu, with the Subject Line: Request Political Maps Paper. Mildenberger, M., Howe, P., Marlon, J., & Leiserowitz, A. (2017) The spatial distribution of Republican and Democratic climate and energy opinions at state and local scales. Climatic Change Letters.